Focusing on what truly matters to you! Just a reminder: If you haven’t read “Living the 80/20 Way” I’d highly suggest reading it right now or whenever you have time in your hands. It is a wonderful book and I can’t begin to tell you how much it has helped me. If you’re finding life to be extremely mundane or are frustrated with the state of your current life then this will surely qualify as a “luxurious read”! Alright so, I’d like to talk about the act of focus. It seems that approximately three-quarters of adults have some degree of ADD(Attention Deficit Disorder). This means we are not able to focus on a given task at times and most often get side-tracked by extraneous thoughts that may not even matter. All the 80/20 Book talks about is focus, focusing on only your given strengths and doing what you love. Once you know what kind of business you want to start if you’re an aspiring entrepreneur, or what career pathway you want to follow, you must find an 80/20 destination in getting there, meaning you must pinpoint the 20% of effort that will get you 80% of the results. This allows a person to efficiently focus on what truly matters instead of banging your head on the wall wondering what it is that you want to do in life. It is also an avenue in optimizing your potential! Focus is one of the greatest assets to acquire for an individual, whether they’re a consultant, teacher, or entrepreneur. Entrepreneurs are swamped with hard work if they are to generate sales and with all of the mental clutter and personal issues going on, it can seem daunting! Can you spell S-U-C-C-E-S-S. If so holler as loud as you can!! Living the 80/20 Way is a book written by Richard Koch and it is truly a wonderful book for the like-minded entrepreneur or any average individual looking to absorb the most of life. I truly feel that after reading this book, with lots and lots of effort any like-minded individual can turn their life around. A lot of us worry about making more money, achieving more success, and gaining more fame and feel that the route to such factors is to do more when this isn’t the case! Allow me to summarize the book in the form of bullet points. Take the 80/20 route in managing money, achieving success, relationships, and personal pleasures, etc. Less is more, less is more, less is more! !, Not more with more, LESS IS MORE!! Need I say more, I may reference this blog entry or the concept in my future blogs, as this should be the path to success in any department of your life, not just working and making a difference in this world. Because the truth is that it is your inner peace, happiness, key relationships, who you’re with, type of friends circle, intertwined with passion of course that propel you to success aside from just working hard. Working long hours is not for everyone and if you’re someone who realizes that working long hours is expending energy, CUT IT!! If you are an advocate of the following statement: “Ultimately, we must all have 80/20 Vision!! !, not 20/20 Vision”, then please like this blog. 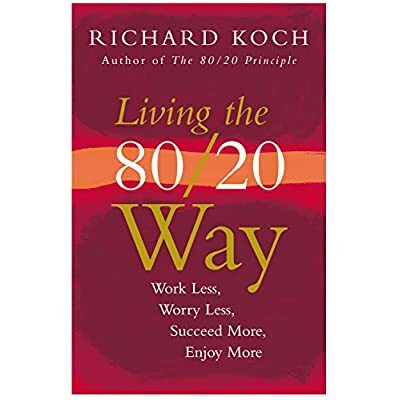 And if you have not read the above book, once again the title of the book is “Living the 80/20 Way” by Richard Kotz, then I highly suggest that you read it! What’s your 80/20 destination? Feel free to leave a comment below explaining it. I’d love to hear from you all! !